Personal Lea: . . . And now for something completely different . . .
. . . And now for something completely different . . . I give you . 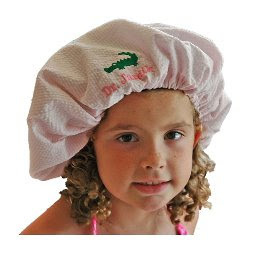 . . the Preppy Scrub Hat! This is for all of those medical people who feel country kitties and bears just don't reflect their personality! If you don't know what this is, it is a hat worn in the operating room - they often wear disposable ones, and I also make a 'surgeons cap' which is the more fitted style. 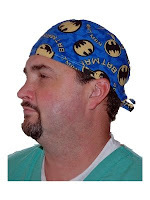 I started making them for my handsome doctor husband and realized that its incredibly hard to find monogrammed or personalized scrub hats - at least ones that aren't really goofy! This would be a nice gift for that special doctor or nurse in your life - the bouffant style my daughter is wearing is very comfortable, and they can be made out of any fabric your little heart desires - yes, even Batman!